On the subject of Varroa mites, I am a slow learner. I was always really against using any sort of chemical treatments in the hives until I decided to learn more about what each treatment does for the bees and their health. Mites are the issue. So, they need to be eradicated. Varroa Mites are external parasites that feed off of honey bees, especially drones. They feed off the bees ultimately weakening and harming them thus, shortening the bees life. The mites also feed off the brood, the bee larvae. This can result in deformed adult bees missing wings or legs. 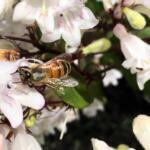 Varroa Mites can kill off an entire colony of bees if they are not properly treated for. 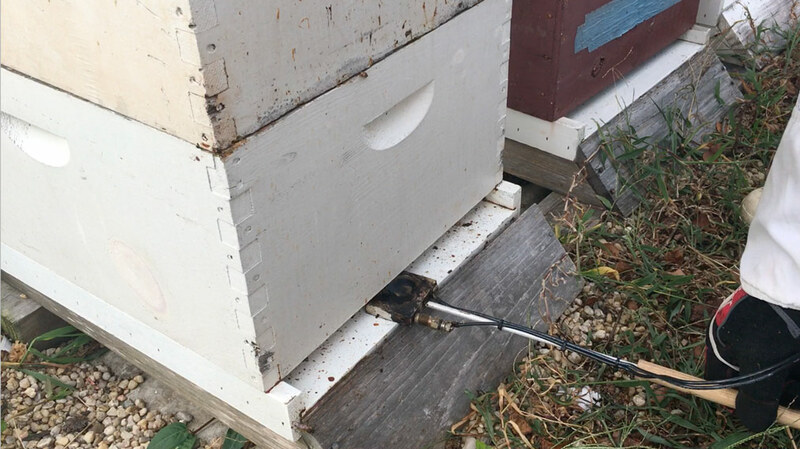 In a conversation with the man that I buy my bees from in early-July this year, he said to me, “Get your mite-away strips on by mid-August” I said, “I usually do that around the end of October”. He replied, “If you wait until the end of October, then I will see you again in April for new bees”. I ordered the mite-away strips and we treated the bees in August. Mite-away Quick Strips are made with Formic Acid. Formic acid is a compound that is naturally found in the hive and is the bi-product of insect bites and stings. It’s proven to be effective against varroa mites. This product should not be used in temperatures over 85 degrees and the treatment stays in the hive for only 5 days. We were lucky this August; it’s usually very hot here in the south. We had 5 days that were about 82 degrees and the process seemed to work. We saw lots and lots of dead varroa mites after the treatment. Don’t ask me to count. I can’t even keep pace with our inventory. The thought of sitting in the bee yard and counting tiny black dots on a white board late in the day– it’s just not going to happen. 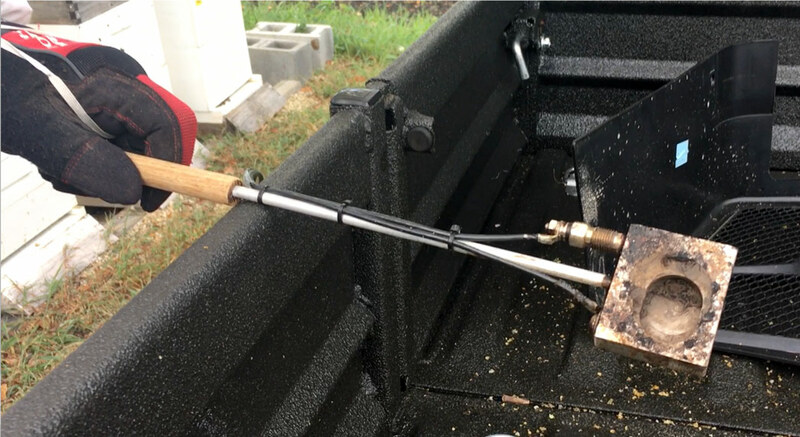 The next step in treating the bees involves vaporizing oxalic acid. Oxalic acid is an organic compound in leafy greens. We started mid-September. We are now treating every 5-7 days or as our schedules permit. Get your Oxalic acid from a reputable source. Treating Varroa Mites Step 1: Measure 1/2 teaspoon of Oxalic acid crystals, drop into vaporizer, connect to car battery and set your stop-watch to see how long it takes to dissipate from the unit. That is your burn time. (You cannot see what’s happening when you insert the unit in the hive). In my case it was 5 minutes. 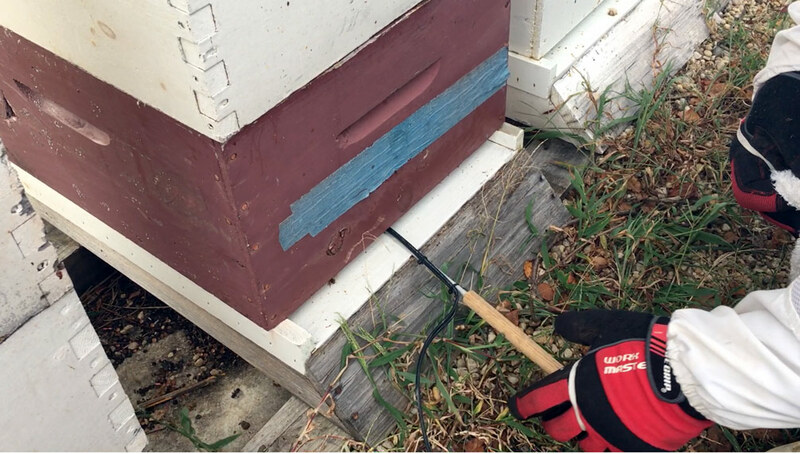 Treating Varroa Mites Step 2: Slip the unit into the hive thru the entrance. Cover the entrance with a towel. Cover any major openings with gloves or paper towels. 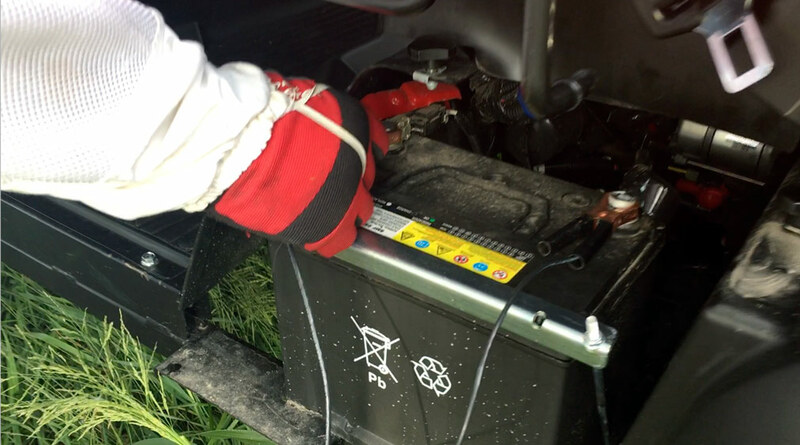 Attach to the battery of a running vehicle and time the treatment. In my case, I set my stop watch on my iphone for 5 minutes. 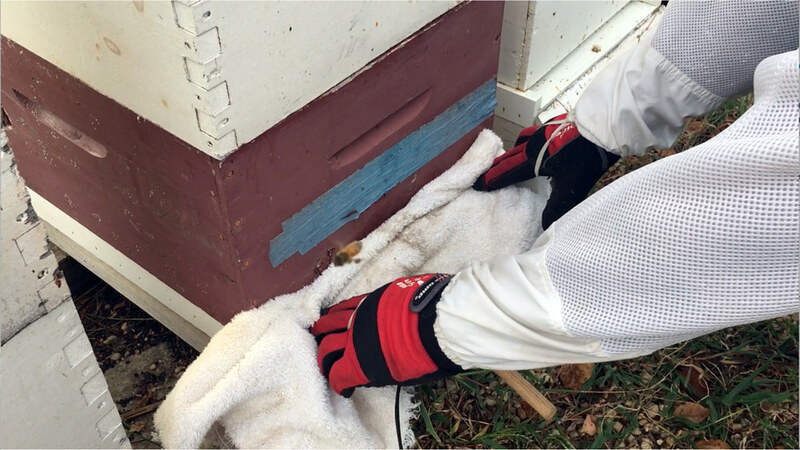 Treating Varroa Mites Step 3: Remove the towel from the hive and remove the unit from the hive. Previous post: It’s National Coffee Day! Let’s celebrate coffee and the bees.